The Thrice-Damned House of Thrune wants to seal the Inferno Gate, an uncontrolled portal to Hell, and the villainous adventurers are called to accomplish the task. To acquire the components and perform the ritual, they must first face down a hellspawn thieves' guild, the Hellknight Order of the Pike, and the knights of the Glorious Reclamation and their celestial allies. But before they can complete the ritual, the characters may be forced to examine their options—is closing the gate the best plan for the future? Will the villains obey their orders to close the gate to Hell—or might they make a deal with a devil for control of the portal? Or will they only become the latest in a long line of sacrifices to the Inferno Gate? 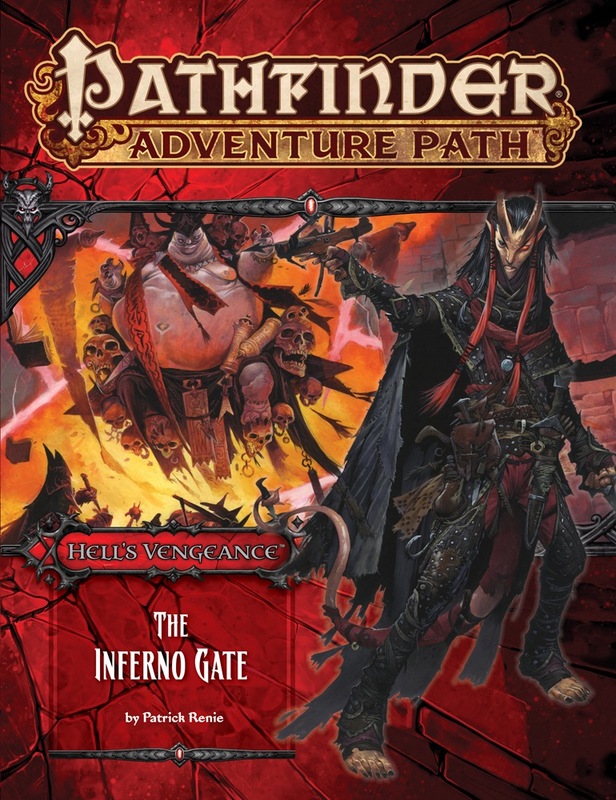 "The Inferno Gate," a Pathfinder adventure for 7th-level characters, by Patrick Renie. A foray into the faith of the archdevil Moloch, by F. Wesley Schneider. Details on various types of magical portals, by F. Wesley Schneider. A last-second rescue reveals an unexpected ally in the Pathfinder's Journal, by Josh Vogt. Five dangerous new monsters, by Benjamin Bruck, Jason Keeley, Jeffrey Swank, and Mike Welham. This is a review for GMs. Spoilers ahead. For the life of me, I don't know how this one got published. It has the most nonsensical plot I've ever read in all my 30 years of gaming. After the PCs disrupt attempts to conquer Kentaria in Part 2 of the AP and cause anarchy in the streets, they're summoned by Archbaron Fex. There, they learn that while they were stopping the Glorious Reclamation at Kentaria, the town of Senara has fallen. But rather than aid any efforts to help retake Senara, Fex first has you swear loyalty to House Thrune, and then...ride off on a ridiculous fetch quest to gain the components needed to close a gate to Hell. No, seriously. I have no idea why anyone thought this would make sense. In a nation full of devil-binders - where the state-sanctioned religion is the worship of Asmodeus - why would anyone loyal to the ruling house want to SHUT DOWN a gate to Hell in the middle of an insurrection? Wouldn't it make more sense to gain control of said gate so it could pour devils onto the ranks of the holy knights threatening to overthrow Cheliax? The logic breaks down even more when the PCs meet some Hellknights of the Order of the Pike in a place called Citadel Ordeial. These guys are monster hunters and are at least dimly aware that an open gate to Hell causes random devils/monsters to romp about in the woods around the Citadel. Uh, okay monster hunters, when did you plan to get on that? Sadcasual did a great job explaining how stupid the encounter with the "tired paladin" is. I can't imagine any party of evil-aligned characters would allow that guy to live. That's forgetting that the whole thing makes zero sense in the first place. 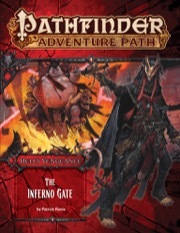 I think the author tried to salvage things in the end by opening the possibility that the PCs would find a way to take control of the Inferno Gate themselves. I think that's highly, highly unlikely. The encounter with Fex at the Gate is sure to spark a slog of combat that will only end with both the heresy devil and the wizard dead. All in all, a very disappointing part of an AP that has a very weak start to begin with. I wrote an in-depth review but the forum ate it. GOOD: Nothing but a few illustrations and Seytiels father. BAD: Everything else: maps, weak enemies, articles, bestiary. UGLY: Patrick Renie clearly has not enough knowledge of the Pathfinder rules and the editors didn't catch the plenty mistakes he made. This AP part is unplayable as it is. Sadly the whole AP is. After two solid books, the third breaks down into a slog through a videogamey map, with the players having to wander at random at times to fill the fetch quest. Literally, the whole book is a fetch quest, and an extremely convenient one at that. I hate missions that describe themselves as sandboxes, especially when the book reminds the GM to throw the accuser devil at the party every time they do the reasonable thing and try to figure out where the hell you are going to find an azata in the middle of the LAWFUL good enemy forces, only to find there is just one hanging out, awkwardly making smalltalk with some archon. Furthermore, there is wierd railroading at times. More than once, the book says "the [enemy] recognizes you as an agent of thrune immediately," despite the fact that the previous book heavily encouraged subterfuge, and, at least for my party, we're casting undetectable alignment like it was going out of style. Any betrayal feats you might have invested in, any Bluff or stealth skills, all gone in the face of the Glorious Reclamation's magical ultrasight. Another strange moment occurs deeper in the path, when the party is given a powerful option, but are told that they are just not smart enough to pull it off. Finally, there is one moment that I reread twice to believe. A random encounter has the party run into one of said Glorious Reclamation intelligence agents whose detect evil and keen wit cuts through Bluff checks, disguise, polymorph, and undetectable alignment like a hot knife through butter. He is a Paladin of Iomedae, and is accompanied by a group of s$%!ty fighters, made s!#%tier by the fact that all of them are Fatigued. This Paladin of Iomedae hails you(! ), acknowledges you as agents of thrune(!!! ), and offers surrender, because his troops are so tired. In exchange for leading them back to the path, he promises the contents of a chest his idiot buddies are carrying ten feet behind him, as well as his solemn vow that he will go back and tell the other Glorious Dudes to back off, Thrune has this whole Gate situation handled. What casts this into the realm of complete and total insanity is that he is LYING. In this course of this adventure path, you will be lied to by a paladin of iomedae, with the game noting that he will seek atonement later. They do not say this causes him to fall. Okay, what. First, the whole premise is bent from the very beginning, since the book assumes that the Lawful Evil, Bad guy, Puppy Punter, Back Stabbing maniacs in the party will EVER accept surrender. If the situation was reversed, and you were a posse of paladins who ran into an Antipaladin who had run out of underlings to cannibalize, you would be expected to murder him! What's more, paladins of Iomedae have specific tenets in Inner Sea Gods, two of which are "I will suffer death before dishonor," and "I will not be taken prisoner by my free will. I will not surrender those under my command." According to paizo, this particular example should have fallen THREE TIMES, once for lying, once for surrendering, and once for surrendering for his troops! Really, this path assumes the players are more LN than LE, and presents bonus exp for letting most of your potential victims live. Other than the most basic pathfinder evil act of all(killing a good creature/outsider), there isn't much wiggle room to work in anything else. The book reclaims one star for having good production values, and solid work in the bonus section. I hope to God the next part significantly more evil, (Oh God, it's called For Queen and Country) or this path might be remembered as the one where you had to collect 4 boar asses to progress to an actual enemy. Portals and gates sounds interesting. OH MY. An Evil 3 way fight, as evil servents of cheliex clash with both the armies of good, and the betrayer who seeks to use the portals power for themselves, and might simply wish to see the world burn. its this situation of moral compromise that makes hell's vengeance more than 'lets all be bad guys'. After all, what is left to rule over if everything is a pile of ash? Where are those placeholder cover images from? I feel like I should recognise them. Extraplanar portals and gateways sound interesting. Ooooh, yet another minor Hellknight order expanded? Goody goody! From the Department of Expectations Management, I have to be clear that the Order of the Pike is not really expanded on in this volume. They play a role in the adventure, but there are really no new revelations about the order beyond what has already seen print. Pity, but it'll be nice to see some of the lesser orders, still! Is it wrong if I said that tiefling looks hot? I am beyond psyched to see Moloch's article. The villains of the very first campaign I ran were a legion of Hobgoblins who worshipped Moloch and integrated devils into their army. To me, it just seemed like an ideal symmetry of alignment, philosophy, and goals between them. The tiefling is from Pathfinder Adventure Path #25: The Bastards of Erebus (tiefling article & back cover), while the background is from Undead Revisited (the opening of the Nightshade chapter/Alain's death scene). Indeed, assuming that Mr Schneider is continuing to write these, and that he does half the job he did with the Crimson Son's write up... why I may just have to book and interview with him. I'm sure we could have a lovely cup of hot cocoa! He does such a wonderful job at capturing the essence of those of us from the Lower Planes while treating us fairly. Quality biased journalism! Wait......what is the crouched figure over the word Vengence on the cover next to the Asmodean Cleric? I'm looking forward to Golarion's Moloch - I'm still used to Glasya ruling the 5th circle, with Moloch in exile on Avernus, so I want to see how he's set up. 'Soon' can relative. A week, at least. If you're like me you'll start checking the product page starting at noon on Monday to see if it's in your downloads yet. Anyone know anything about this one's Bestiary yet? Other than the people who worked on the book (and most likely aren't telling), no. The first subscribers should get their subscription copy Monday, and I expect spoilers to start flowing then. Lythirium - CR 11, Plant, looks kinda like the Grim White Stag had kids with a wolf. Mederach - CR 9, Chaotic good spider Outsiders. Egalitarian, scholarly, and predisposed to peace. Looks awesome! I'm almost too busy squeeing over getting this thing to actually pay attention to the rest of the bestiary. Waldgeist - CR 8, more incorporeal undead, this times with ties to forests and the ability to possess trees. With a name like that... Honestly, the only other way to make that name make sense is to have it be a ghost Treant/Dryad. So what diabolical evil can one get up to in this volume? They are actually supposed to come from gnomes, although I'm sure you could make an advanced one to represent the ghost of a Trent. That's actually an awesome idea, I may steal it! I haven't read the adventure yet, but going by the art, there is definitely some unicorn hunting going on. I'm very excited to learn about the new Moloch article. What is the artwork of him, and what does the priest look like? Portrayed as a fiery being mostly encased in armor with a bull-horned helm, wielding (what appears to be) a fiery sword and mace. Besides "He lives in Maleboge and leads Hell's army", what else do we find out about him? He is mostly that. Before his fall, he was in charge of burning heresies in Heaven's forge. He became what he is by 'following orders' (by Baazebul, under Asmodeus' orders - both were still 'angelic'). An interesting thing of note is that he and the Horseman of War are in contact with one another (which may explain that image in Szuriel's article). I could swear I have seen that picture of Moloch's priest somewhere... Maybe in Chornicles of Damned? Anyway, yeah, Moloch's artwork looks like picture of him you get by googling his name and Pathfinder together. Not much of chance from that horned armor/magma rock thing. i find the artwork on p. 32 disturbing and wish paizp would have ordered another scene to be drawn up. I can't tell you how happy I am at your reaction to the mederach, which I am certain was wonderfully developed by Amanda Hamon Kunz. Why does Darellus Fex betray the party, where does he attack them, and what kind of help does he bring? Well, since "Waldgeist" literally means "Forest Ghost" or "Forest Spirit", it makes sense that it'd be an incorporeal undead or fey with ties to trees and forests. Fex is a lvl 12 conjured, and so needs no other help. HOWEVER, he is assisted anyways by Razelago and a CR 12 devil, who fortunately can be convinced to sit the battle out. The fight takes place at the close of the adventure, near the gate itself. Fex betrays the party not so much because he doesn't like them, or because they're a threat to him, but because they might become a threat at some point and he needs a few sacrifices to achieve ultimate cosmic power, so why not kill 2 birds with 1 stone? After getting them to do his fetch quest first, of course, and possibly dealing with the local Reclaimation interference. Dude might not be honorable, but he isn't wasteful. As far as evil you can commit goes, it all really depends on the players. This adventurer could be run reasonably well with a LN party, and several times you can choose to be merciful, or at least uninterested in evil for evil's sake. The review up by sadcasual goes over some of those times, so I won't repeat them. The main plot involves fetching several items, including the hearts of four celestials, and four unicorn horns. Killing these creatures is undoubtably wicked, but the reason you're told you are fetching them, closing a portal to hell, is an arguably good act. In fact, I'm starting to move to the opinion that the entire adventure would be enhanced if instead of trying to close the portal, Fex tells you from the beginning, "We're going to take control of that portal in the name of Thrune and use it to tie up the Reclamation around Senara." He need not mention that the souls and lives of the party are main ingredients to taking over control of the portal, or that he has no intention of giving control over to house Thrune once he has it, so the betrayal can still go off as written. It's a minor change, but one that would definitely push the adventure to "Team Evil", might affect interactions with the Order of the Pike and Reclamation, and would fit with the general theme of the previous volumes, reclaiming Reclamation territory. The whole 'non-evil spider monsters' part is what intrigues me I may be an arachnophobe, but it gets tiresome to have every spider-beastie be insanely evil and out for the PCs' blood.